I never had the chance to meet Andrea Cheng but I handled her books, I sold them. I was in the same space as them. A Cincinnati author, talented and kind are some of the things people told me about her. Interestingly enough, I’ve been connected to her for quite some time though; I went to school with one of her daughters, Ann. Recently I was able to reconnect with Ann and spend time with two of Andrea’s close writer friends. Here’s what I can say about Andrea Cheng, now that I’ve read her words for myself and can reflect on her people; her voice is strong and she’s left a legacy of goodness. Etched in Clay is poetry inspired by the historical record of an amazing man named Dave (David Drake). Dave was a skilled potter/poet who happened to be enslaved. Cheng speaks for him but doesn’t say too much. It’s just enough. We follow Dave from his teenage years fresh off the auction block to his life as a free man in his seventies. He’s sold and re-sold several times within the Landrum family to work their pottery works. His first owner, Harvey Drake, notices his talent and teaches him how to create pottery. Drake’s religious wife Sarah gives Dave a powerful tool too, a spelling book from which he learns to read and write. In his long life, he is split apart from the women and children he loves, he struggles with his lack of agency as an enslaved man and he REBELS with words and poetry. Words spill out of his head and onto his pottery. Dave finds a way to assert his worth as a human being through the liberatory act of black creativity. Harvey Drake (like most whites at the time) is conscious of the danger in nurturing the intelligence of a slave. He’s comfortable in his power and is protective of the system that keeps his whiteness above blackness. Though Dave knows he can be lashed for knowing how to read (and showing it), he does it anyway. Even signing his name on a pot is dangerous yet he does it…and by doing so, he reflects on his legacy (his pots are made to last) and asserts HIS power. His defiance is through words. Andrea Cheng doesn’t romanticize or soften slavery; she gives us a glimpse of Dave’s reality. I appreciate her honest characterizations of the slave masters and their disregard for Dave’s (and the other slaves’) humanity. The entire book is full of excellent characterization! A masterful storyteller has the ability to make you bubble and boil with frustration yet eagerly reach to turn the page. I wanted to keep going and see what would happen to Dave, a man who, like my ancestors, was remarkable. The woodcuts in this book are also done by Andrea Cheng and just like the writing, they are just enough (and so much). They give us a glimpse into Dave’s life with blocky shapes, black and white lines and outlines that suggest more than tell. Not only do I recommend Etched in Clay for casual reading, I think it’s perfect for the classroom. There are so many lessons to take away and to discuss and Dave should be more well known. I hope you’ll pick up this book and enjoy. A passionate woman full of energy, charisma and magic was Josephine Baker. Patricia Hruby Powell uses the metaphor of volcano to describe Josephine’s personality and I think this is perfect. Ever since a little girl, she bubbled and popped and fizzled with pent up energy to perform and dance. She was born poor in segregated St. Louis to a single mother who also loved to dance. They shared a love of vaudeville. As a child she started out in the group The Jones Family but quickly moved on to The Dixie Steppers. Even in a chorus line she stood out with her distinct, silly style. She got hitched, went to broadway and used her smarts to get onstage and SHINE. Look how spunky and charming she is in the film Zouzou (1934)! Though she loved to perform, Josephine was tired of segregation and just barely getting by. She got the chance to head to Paris where as soon as she stepped off the steam ship, she wasn’t discriminated against because of her color and felt truly beautiful! She took Paris by storm, charming the entire city, headlining shows, staring in movies and drawing crowds with her energy and risqué banana skirts. She was in every way fabulous, scandalous and daring. When war came she spied for France and became a hero. As she got older, she remarried and adopted twelve children from all over the world; her rainbow tribe. Though she worked hard to support her children and keep up her lavish lifestyle, she was put out of their mansion, the bills too much to pay. Luckily her friends helped her family and years later, at sixty-seven years old, she decided to give the US one more try. It was a success! America loved her and dear Josephine danced herself to eternal sleep. The rhythm and energy of the writing in this book suits Josephine’s personality. It’s broken very cleverly into “acts” of her life. Robinson’s illustrations, as usual, are vivid and beautiful. His signature long bodied figures are perfect for Josephine’s limber body. The book opens with a red curtain, each “act” is introduced by a scene on a stage and finally, after we finish reading the story, the red curtain returns, flowers stewn on the floor below it. I love this touch. It brings the story full circle; she lived for performance. Robinson says in the end notes that he’s been connected to Josephine Baker’s story ever since he was young and it’s very evident in the loving way he depicts her. This classic from my childhood discusses the importance of allies on the road to freedom. Abolitionists helped fearless slaves free themselves from oppression. Peg Leg Joe, the abolitionist featured in this story, may or may not have been a real person but the Underground Railroad was definitely real. 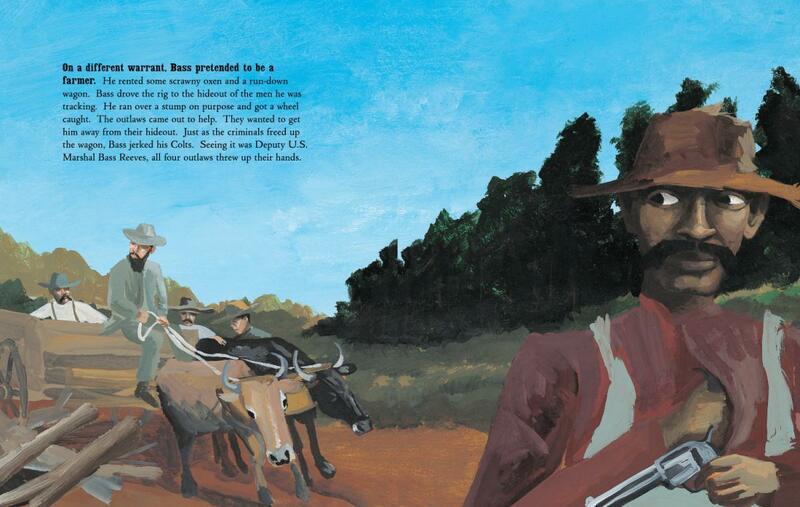 In Follow the Drinking Gourd, Peg Leg Joe works at cotton plantations with the sole purpose of teaching slaves his song, Follow the Drinking Gourd, which tells them how to get to freedom. One day, Molly’s husband James is sold to another master and they have only one more night together. Slaves often had their families suddenly torn apart in this way. But that night they hear a quail’s song, the first clue from the song to get moving towards freedom. They decide to make an escape. The family follows the Drinking Gourd (Big Dipper), remembering the lines of Peg Leg Joe’s song for guidance. They hide from hounds and look for signs that they’re heading in the right direction; North. They get help from farmers and finally meet up with Peg Leg Joe who takes them across the Ohio River to their next stop, the house of a white family. They keep moving from house to house and take time to rest and heal and even stay at the place of a free black man. The family finally makes it to Canada, to freedom. This has always been one of my favorite books about slavery because it presents it in a clear, easy to understand way. Children who have no understanding of slavery will need some explanation as to why the family wants to escape. There are no happy slaves here; we see the family’s hesitation, worry, fear and finally joy and relief. Jeanette Winter’s illustrations are extremely moving; especially the one with James on the auction block, head down and distraught, “Negroes for Sale” below him. I read this book quite often when I was young, so much so that the images are still very familiar to me. Be sure to check it out and discuss! The complete song is included on the last page. Martin de Porres was born to an African/Native slave mother and a Spanish nobleman father in the barrios of Lima, Peru. The priest of a cathedral reluctantly baptized him, not knowing or caring that Martin would grow to be a true man of God. Martin lived with his mother and sister in poverty until he was 8 years old when his father came and took them to Ecuador. Martin came back to Lima to be an apprentice to a surgeon (a cirujano) and excelled at it. Because he was African, people were prejudiced towards him but his skills were obvious. He was gifted lemon seeds for helping a man and after planting them, the next day a tree grew. At fifteen he wanted to become a priest but was denied the opportunity due to his mixed-blood. He offered to clean, wash and care for the monastery instead. People started to notice his gift with animals and his amazing healing powers. He performed miracles. Everyone, from the poor to the rich, came to him when in need. After many years of service he was allowed to become a priest, was finally seen as a brother, and continued his good deeds until his death. The illustrations are absolutely gorgeous and soft. I also love Diaz’ work in Wilma Unlimited. He has a very distinct style. My favorite spread shows Martin blissfully surrounded by a horse, chickens, mice and dogs. They all show their love and appreciation for him and he gives it back just as much. To his mother, Martin was always a Rose in the Desert but finally, despite his brown skin and heritage, he was seen as the true rose he was, by everyone. Martin de Porres was beatified in 1837 and finally canonized in 1962. He is the first black saint in the Americas! How fitting this caring and spiritual man of color be named the patron saint of brotherhood, those of mixed race, animal shelters, interracial relations and social justice! This book is a tribute to the slaves who built the White House, a building never meant for their Black Bodies…but yet! The writing of Brick by Brick is beautiful. Charles R. Smith Jr. plays with the word “hand” by focusing on the slaves’ hands while describing their position as hands, as workers. Slave hands, white hands and free black hands worked together but slave hands did the most of the hard work to build the original White House for John Adams. They hauled stone, laid brick and sawed through logs with blistered, tired, bleeding hands. They suffered while their slave owners took the money earned. Yet, as oppressed people do, they survived, thrived and learned. As the White House came to completion, slaves were taught new skills to finish the fine interior work of the house. With these new skills, they were able to save money and work towards paying for their freedom. Brick by brick they built the massive structure but they also built a way out of enslavement. I love how Charles R. Smith Jr. works NAMES into the story. We read and speak aloud the names of these amazing people. By including the actual names of slaves who worked on the White House, he brings them to life for us and honors them. Cooper’s illustrations, as usual, are skilled and moving. He depicts the slaves’ warm dark brown skin, strong hands and raw expression beautifully. For another example of his beautiful work, check out Ruth and the Green Book. Brick by Brick‘s words and illustrations create a portrait of the people who built one of the most important buildings in our country. The White House is a symbol of “freedom” yet it was built by the hands of those who were not free. This book is excellent for sparking discussion and is important because it covers a part of history that may not be very well known. Enjoy this book, read the Author’s Note and talk, talk, talk! I love to watch track. I was lucky enough to see Usain Bolt in my town of Daegu, South Korea a few years ago. Whew! The speed and athleticism. Wilma Rudolph is an inspiration not only because of her athletic accomplishments but also for the hurdles she had to cross in her life to achieve greatness. Born the twentieth child in her family, she was small and sickly though full of energy. Her family gave her love but there wasn’t much they could do when she was stricken with polio around age five. On top of her physical ailments, she was a black girl in segregated Clarksville, Tennessee. There was only one doctor in town who treated blacks and he was fifty miles away! Despite her struggles, Wilma was extremely determined and even while wearing braces on her legs, she worked on her strength. One day at church, she stood up without her braces, walking confidently down the aisle. Wilma’s 100m dash win at the 1960s Rome Olympics. Woooo! The illustrations of Wilma Unlimited are beautiful. They’re a mix of acrylic, gouache and watercolor with spreads that use photographs for backgrounds. I love this effect. The page where Wilma and her mother triumphantly wrap her steel brace in a box to send back to the hospital is surrounded by a photograph of a cardboard box marked “fragile.” Diaz’ style is wonderful. His human figures have long bodies, wide eyes, strong noses, large hands and remind me of Greek figures on ancient vases. Have a young runner? A child with boundless energy? Check out this beautiful biography about one of our greatest athletes! “Bass shook his head. He hated bloodshed, but Webb might need killing.” OH SNAP. The story starts in medias res with an action-packed showdown shootout! Reeves has the tough job of being a lawman in Indian Territory. Though Natives were forcibly moved to Indian Territory to live, Whites squatted there illegally. The Territory was ripe with outlaws, gamblers and dangerous people. Reeves was the perfect man to uphold the law; in addition to being clever, well respected and honest, he was a crack shot, tall, broad and strong. He grew up a slave in Texas but escaped after an altercation with his master to Indian Territory. There he lived with tribes and learned their ways and languages until the Civil War when he became free. Reeves married, had kids and was hired on to be a Deputy Marshal for Indian Territory. Though he couldn’t read, he had an excellent memory and was known for his disguises and clever schemes to track down outlaws. Being a church-going man, he also tried to talk sense into the criminals. Though he was generally respected, he was still a black man with power and many whites weren’t keen on that. When Oklahoma became a state in 1907, Reeves lost his job as Deputy Marshal but became a part of the Muskogee police force. In his entire career, he only killed fourteen men in the line of duty!!! R. Gregory Christie’s illustrations bring Reeves and the unpredictability of the Wild West to life. He’s a great illustrator. 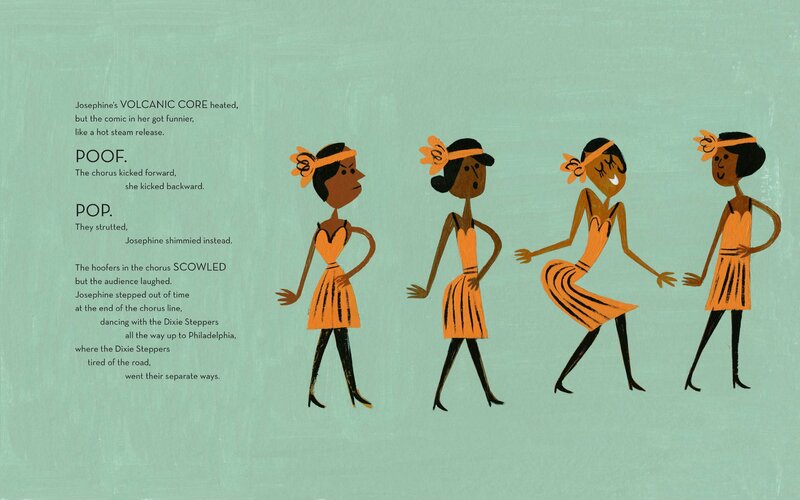 Micheaux Nelson and Christie also collaborated on the excellent book, The Book Itch. In this book, Christie’s color palette is full of sandy browns, rich greens and dark colors. The first page with outlaw Jim Webb bursting through a window (shards of glass flying) to escape from Reeves on horseback is my favorite. Be sure to check out Bad News for Outlaws: The Remarkable Life of Bass Reeves, Deputy U.S. Marshal. He isn’t as well known as he should be and this picture book is an excellent introduction to his remarkable life. P.S. HBO is making a mini-series about Bass Reeves. Click here for more information. Fannie Lou Hamer spent her entire life doing just that, fighting for black people’s rights to equality and justice. This mighty woman was one of class, power, strength and dignity. I see my grandmother in Fannie Lou Hamer’s big body and I see my mother in her strength despite her weariness. She suffered yet continued to rise and speak, and sing, and empower. Weatherford does an amazing job (as usual) of crafting Fannie’s voice as we follow her story from childhood to adulthood. The words of the book are a combination of Weatherford’s storytelling and Fannie’s powerful quotes. While reading, I reflected on history and couldn’t help but compare the struggles people faced during her time to those of people of color today. I admire her strength. She grew up poor, the youngest of twenty children, picking cotton in the fields while living and breathing injustice. From an early age, she saw that black people didn’t have it equal; that they had to work hard just to get a little. Fannie eventually marries and loses the ability to have her own children (her body is policed by white supremacy and classism) but she yearns for change and starts to push for black voters’ rights. Her determination to vote brings attacks on her life but she keeps moving forward to become a leader of the SNCC. Her spirit is never broken. She runs for Congress several times and reaches back to help the younger generation with Freedom Summers. Towards the end of her life she starts programs to help poor folks and also wins a lawsuit to integrate the public schools of her home county in Mississippi. I spent just as much time enjoying Ekua Holmes’ illustrations as I did Weatherford’s words. After reading the rich text I’d turn to the illustrations and let them have their turn speaking to me. So much is packed into her painting-collages; varying shades of brown for skin, angular faces, flower bursts, patchwork, and texture. I love the pages where young Fannie holds a cotton plant quietly as her family members drag the long white bags that resemble ghosts and the final page, an older Fannie’s strong and beautiful profile with the American flag behind her. Weatherford’s books always have amazing art and this one is no exception. When I think on this woman, I wonder…was there ever a selfish bone in her body? No. Fannie Lou Hamer’s life was in every way about service. What a picture book. What a way to start many meaningful discussions. Voice of Freedom Fannie Lou Hamer: Spirit of the Civil Rights Movement is deserving of all the honors it has received. We’re still pushing ahead Fannie. If you can get your hands on these books, please do! They’re by the Empak Publishing Company (Empak Enterprises, Inc.) and I believe there are ten books total in the series. They’re most likely out of print now (mine are from the 80s) so you’ll have to look for them at a used book store or online. What I love about these books is that they cover so many great topics like Historic Black Women, Historic Black Firsts, Historic African Kings and Queens, Historic Blacks in the Arts, Historic Black Educators, etc. 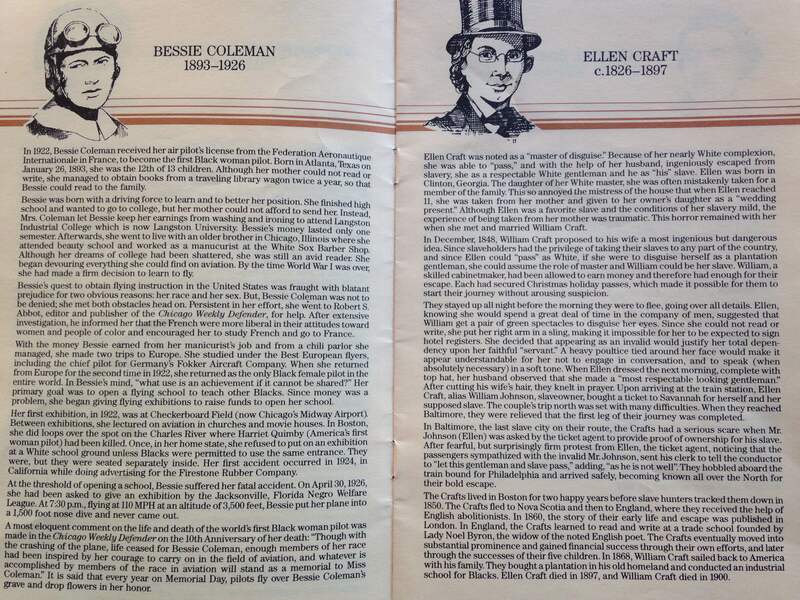 Below is a sample page from A Salute to Historic Black Women (Vol. 1 in the series).